Fresh off the February festivities in Pyeongchang, South Korea, Olympic fever is slowly fading. But for a small community in the Upper Peninsula, Olympic dreams are still very much alive. In Ironwood, a village that sits on the Michigan and Wisconsin border, visitors can travel down a country road to Copper Peak, which is currently a tourist stop for breathtaking 360-degree views. 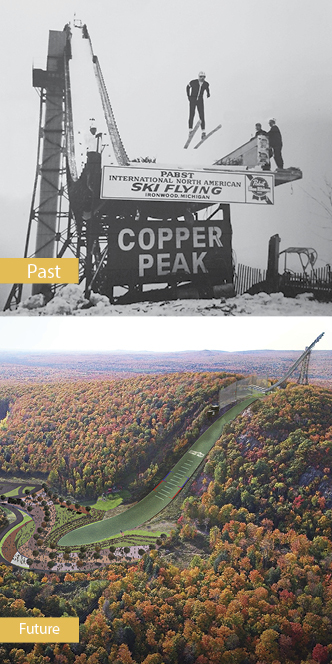 However, between the 1970s through the 1990s, Copper Peak was a premiere ski jump for would-be Olympians and ski jump enthusiasts. And, if a dedicated band of supporters have their way, it will be again. Artistic rendering, provided by Populous, shows the future plans of the Copper Peak site which includes adding a plastic landing hill and porcelain track down the in-run to prepare for summer ski jumping. 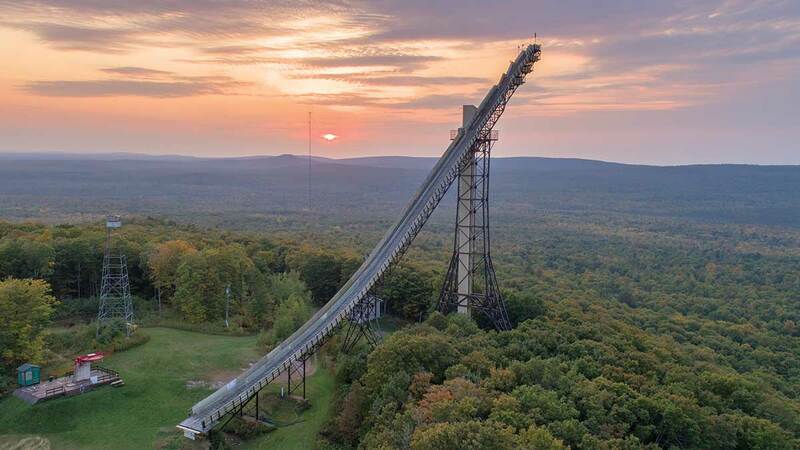 The Copper Peak ski jump sits 469-feet-high and looks over 2,500 square miles. The view from the world’s largest artificial ski jump includes three states (Michigan, Wisconsin and Minnesota), majestic Lake Superior, and the winding Black River as it cuts through the woods. In its prime, it hosted 13 ski flying events in its nearly 25-year run. The Copper Peak ski jump eventually closed due to financial constraints, but by no means remained dormant. Administrators believed that the views from the top of the jump should be enjoyed by more than just the lucky few jumpers and flyers who competed and trained on the hill. That’s when the Copper Peak Adventure Ride entered the scene. The return on the $20 ticket price ($20/adults, $8/children) more than pays for itself. Adventurers take an 800-foot-chairlift ride to the crest of the hill, followed by an 18-story elevator trip to the main observation deck. If you’re feeling even more daring, individuals can climb eight additional stories to the top of the jump’s starting gate. Breathtaking hardly describes the feeling, adventurers say, as they look out over the landscape with a view that few get to experience. While bringing those amazing views to nearly 10,000 ticket buyers last year was inspiring, those who have known and loved this hill—including team members, athletes and community members—still dream of returning Copper Peak to its former glory. A few years ago, that group of ski-jump enthusiasts and go-getters began efforts to upgrade the jump to meet modern standards and reached out for fundraising and, eventually, legislative support to return Copper Peak to a premiere competitive ski jump and training site. Copper Peak is all about the adventure and is excited to be hosting the Red Bull 400, a grueling, 400-meter sprint to the top of the ski jump that will put each athlete’s calves, quads and endurance to the test. The event on Saturday, May 12, is open to the public and, much like the view from the top, will be a remarkable site to see. The mission is to re-establish Copper Peak as the western hemisphere’s largest active ski jump and host the Summer Grand Prix competitions. Visit copperpeak.net to learn more.